We had a small streak of nice days: 60 degrees + with little rain. It gave me a good chance to get out and start taking care of the spring cleanup and get ready for planting. I have had a huge truckload of wood chips sitting in my backyard since fall, so I was very happy to start moving it around to the different areas that I use it for each year. A friend of mine that owns a tree service is happy to donate his chips to me whenever I want them-free of charge. So I started around the raised beds in the garden. Making good places to walk which will keep the weed growth down in between the boxes. 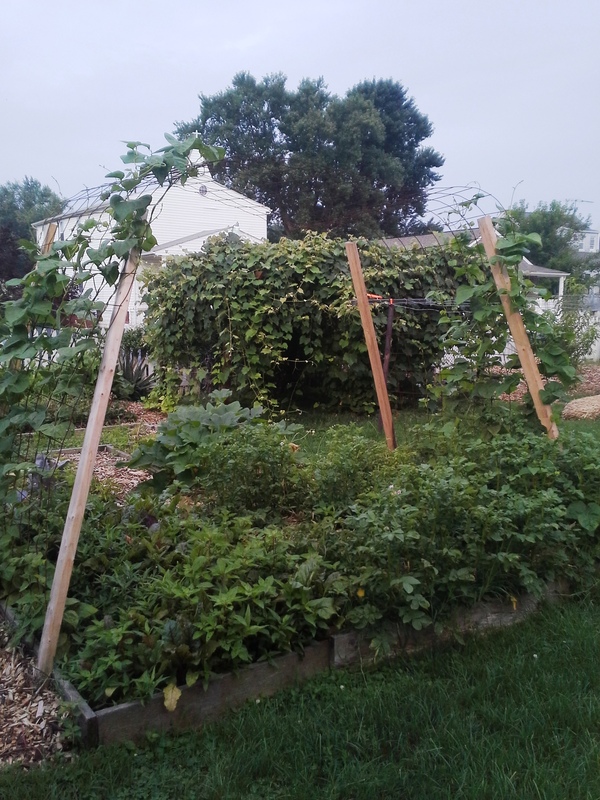 Once the garden paths were complete, it was on to the permaculture in our front yard, as well as surrounding all of our fruit trees. 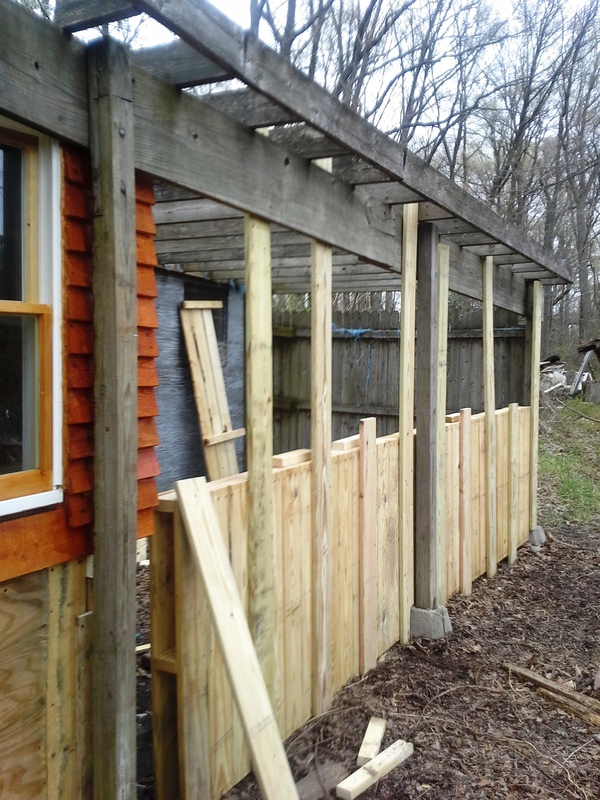 Everything is really starting to take shape, Unfortunately, some cold weather has returned and other projects have gotten my attention. We are supposed to be back in the 60’s next week, so I will probably return to planning/prepping outside then. How do you know if the food you are purchasing is genuinely free of synthetic pesticides, fertilizers and genetically engineered food? How can the consumer rely on the fact that a farmer says his produce is “organic”? The only way to be sure that it is really an organic product is to purchase certified organic products that have the label USDA/Certified Organic. In 1990, the Organic Foods Production Act established national standards for labeling found on the USDA website. Businesses cannot claim they are organic without having the USDA certification or they risk a heavy fine. Farmers apply for “organic” certification. Diligent records must be kept. The land must meet certain standards. The farmland must remain dormant for three years. During this time synthetic chemicals, pesticides, fertilizers, or fungicides cannot be utilized. Third party inspectors check the fields, and complete stringent soil and water tests. The USDA/Certified Organic seal may be found on products like meats, milk, eggs, cheese, and vegetables. What do the labels on these products mean? 100% Organic- on the product means 100% organic ingredients. Packaging can display the USDA/Certified Organic seal. Organic– on the product means that the ingredients are 95-99% organic ingredients. Product can bear the USDA/Certified Organic seal. Made with Organic Ingredients– means that the item contains 70-94% organic ingredients. They cannot display the certified organic label. Other- on the packaging contains less than 70% organic ingredients and cannot bear the certified seal. A genetically modified organism (GMO) is an organism whose genetic material has been altered through g enetic engineering. DNA molecules from different sources are combined into a molecule to create a new set of genes. This DNA is then transferred into an organism. This may give the new organism desired traits, such as better disease resistance or withstanding cold temperatures better. Genes are spliced into the host like tumors invade cells. Scientists can alter an organism by manipulating DNA with cancer causing pesticides in the cells of the plant to produce plants that can withstand greater amounts of pesticide without wilting or dying. 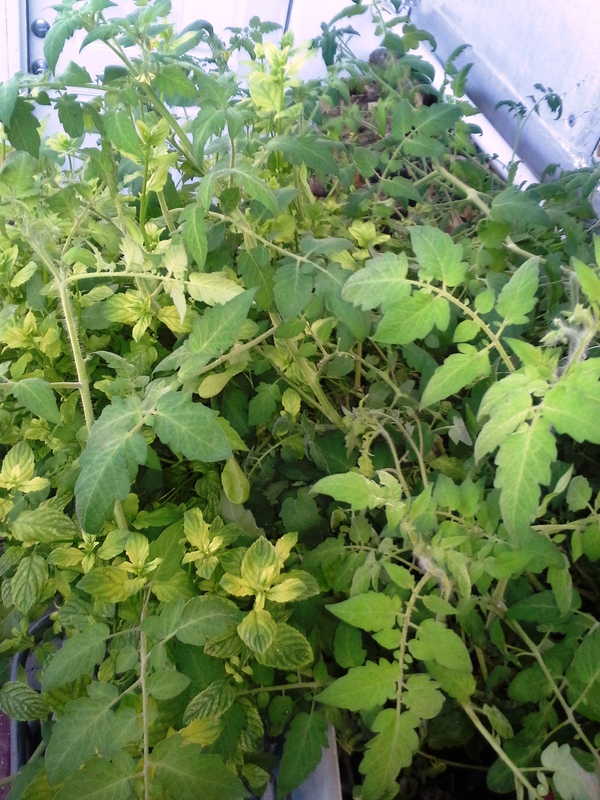 Scientists have also crossed tomato plants with fish genes so that tomato plants will become more resistant to cold weather. These genetically modified organisms contain pollen with the new genetically altered traits. The pollen can be eaten by birds or insects and travel through the wind to pollinate other organisms that have not been genetically altered. The natural species can not survive with the GMO one. Thus, all of the pollinated plants will produce genetically altered seeds/plants/organisms. Food labels in the US do not have to inform the consumer that the product has been genetically engineered. But if an item is marked “certified organic” that means the produce is free from genetically modified organisms. Five of the top hosts of GMO are corn and corn products, soy/soy products, rice, wheat, canola and cottonseed oil. How safe are the new GMO’s that we eat? How long were the GMO’s studied? There are some groups that think that a complete ban on all GM food would be necessary until studied further. Still, others want a least a mandatory labeling of GM food until the long term health effects of eating these foods are known. These products still have some environmental safety issues: possible destruction of entire food chains if the GMO is unleashed to pollinate non GMO produce. Some countries around the world are banning production of any GMO’s. Some counties in California are putting bans on producing genetically modified food at this time until some of these issues are resolved. What options do we have? 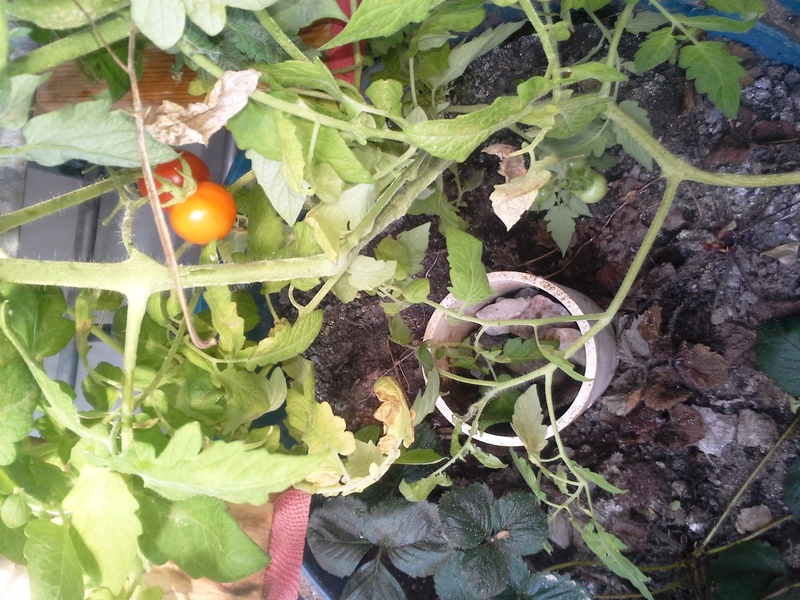 Of course, first and foremost if you have the land, or enough area for a container garden, grow your own. (At least until the genetically engineered foods have been studied longer.) 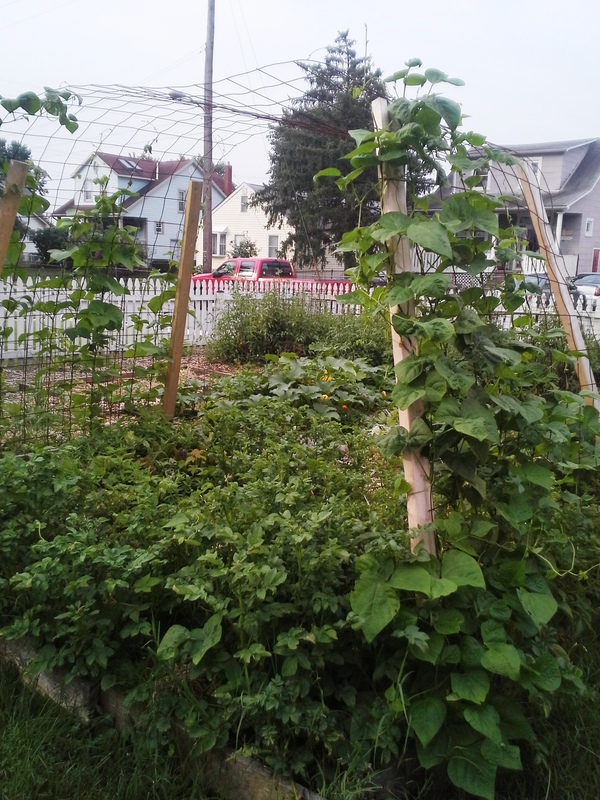 Growing your own food gives you the knowledge of where your food came from and how it was grown. You can feel comfortable feeding your family and know that you are not eating genetically modified foods. Secondly, you the consumer can shop at grocery retailers that sell certified organic foods. This segment of foods is growing quickly as more and more consumers turn to a healthier lifestyle. At the time of this writing, these foods are approximately 5-8% higher in price, but as with anything, as demand grows the price will drop. Personally, I feel that the consumer should be informed about any foods that contain GMO. That we, the consumer, should have the right to decide whether we want to or eat these foods or not. The microbiological process that creates compost is the natural process through which plants and other organic wastes are broken down. 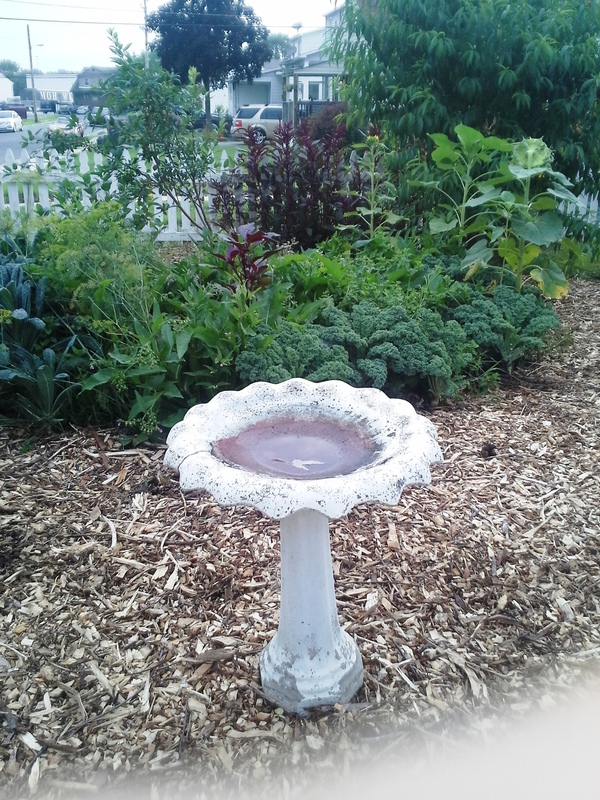 Worms, insects, fungi, bacteria, and other microorganisms help breakdown the waste to create compost. 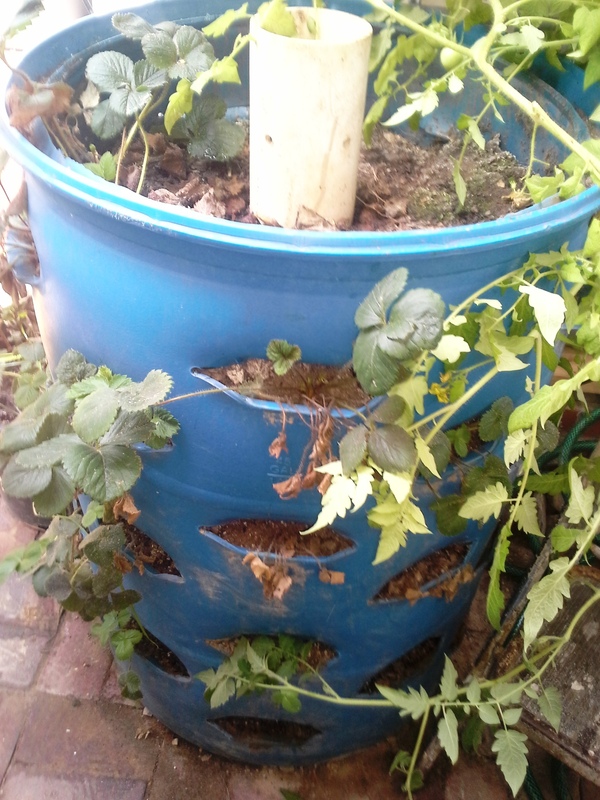 Composting is a natural process. There is no need to obsess over creating a rapid, robust compost because even a failed compost heap will eventually succeed. 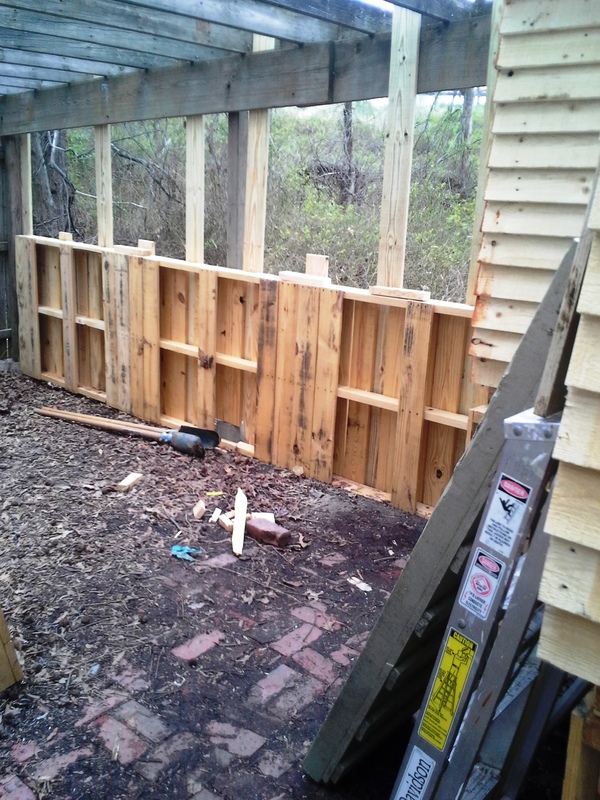 That said, a very effectively created compost heap will proceed to finished compost much, much more quickly (and can be a strangely rewarding accomplishment). 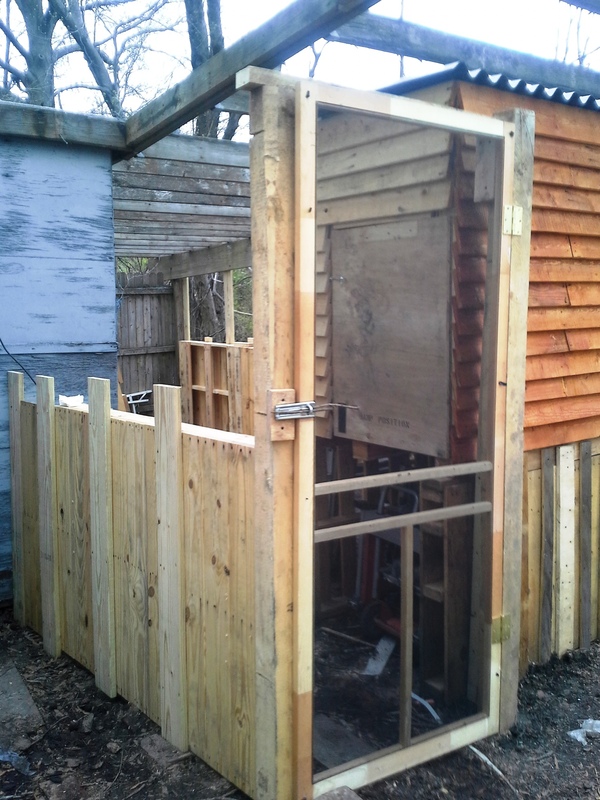 Many different compost bins are available, for many different prices. In fact, many cities offer conservation incentives through which they offer bins at highly discounted rates. Which one should you get? Choose the one that fits your household. thing In fact, no container at all is just fine too! Some of the best compost heaps are just that – a heap in a corner of the yard with a small enclosure or picket fence to keep things looking tidy. Oxygen is introduced by turning the compost (a pitchfork works best) about once a week, or when the decomposition slows down. If you have built a heap with a good carbon to nitrogen ratio, and one that’s sufficiently damp and oxygenated, the composting process should start immediately. When the process peaks, the center of your pile will be producing heat (sometimes a surprising amount of heat!). It is up to you whether you want to completely compost a batch of wastes and then start over, or simply add wastes as they become available. When the center of the pile cools, the process has slowed and it’s probably time to turn your pile. Repeat until you’ve got nothing left but black gold. 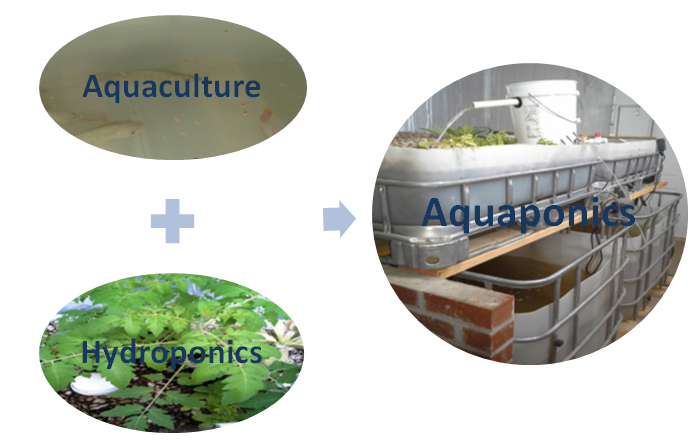 If you are thinking about joining the great world of aquaponics-Here is your chance! Because of the uncertainty of getting IBC totes for class-at this time we are ONLY OFFERING THE AQUAPONICS BASICS CLASS ON THIS DATE! If I have the ability to get totes-I will open up the tank building class and those who have signed up for the basics class will be given first option for the class. How does it differ from hydroponics, aeroponics, or aquaculture? 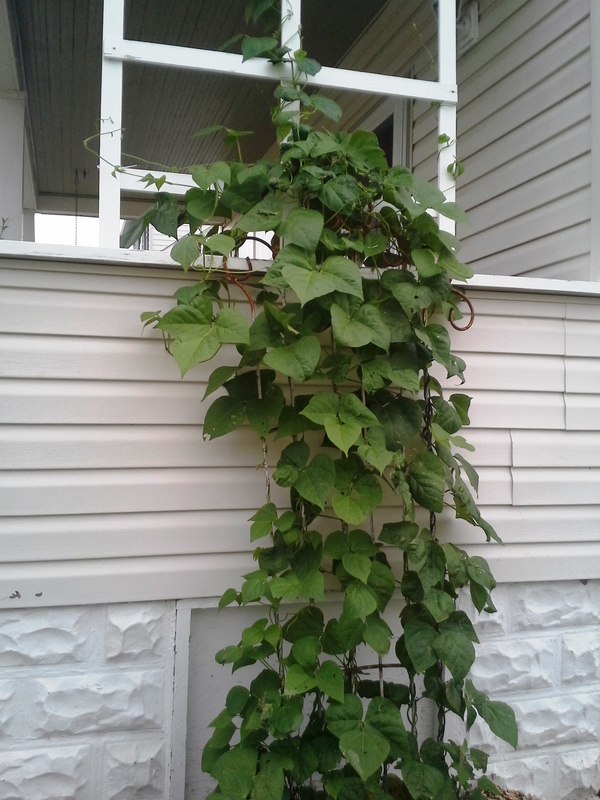 Is it cost effective to grow this way? Do you need permits for vegetable/fish sales? NOTE: for Washington, DC residents: since Marijuana is not legal in MD, I cannot teach to that specific plant, but will answer any questions as best I can. 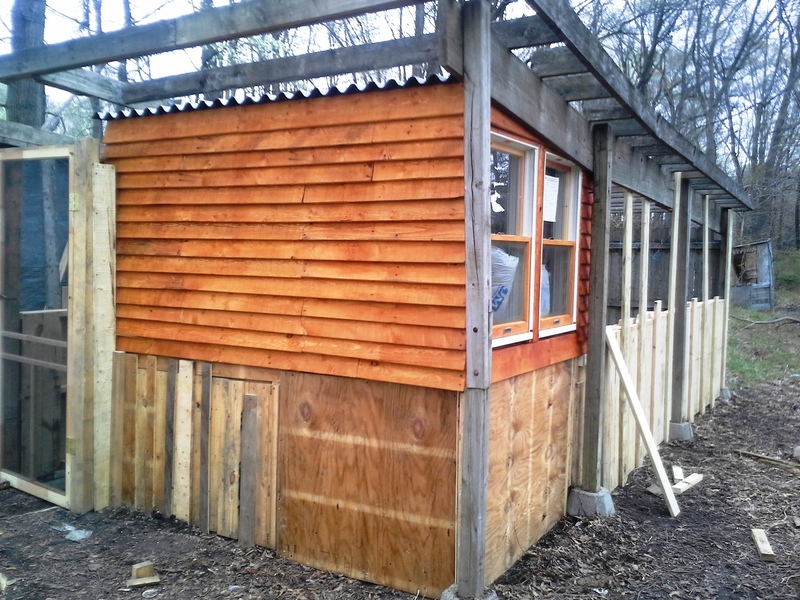 Outside system or in a garage, shed, or greenhouse. We will also be covering topics about: cycling your tanks, grow media, heating, lighting and covering any questions that you may have leading a good understanding of aquaponics and how to start. 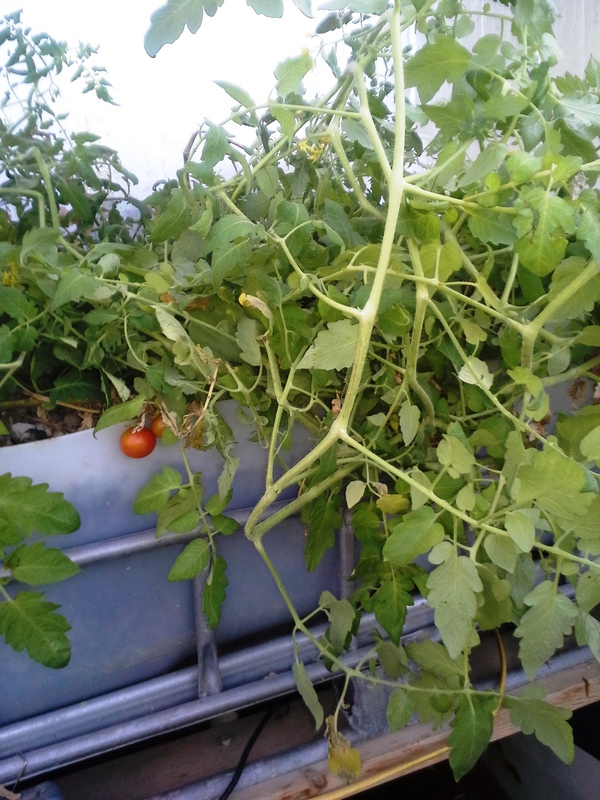 After attending the basics class, you will have the knowledge to successfully start your aquaponics adventure. Once completed in the greenhouse, you will roll your sleeves up to be completing your own IBC tote tank system. Be sure to bring your truck or trailer. We sold almost 100 of these last year at $299 each and you will take yours home with you the day of class! I will take you through step-by-step in building your tank and the importance of measurements, heights, and clearances to insure your tank will function properly. Although we will have the majority of the parts pre-cut, please have knowledge of basic hand tools and drills. If you have a battery operated drill, feel free to bring it. With any system there is some basic maintenance. As we complete the tank systems, I will cover basic maintenance and common causes of malfunctions, as well as the necessary steps to solve and prevent future issues. 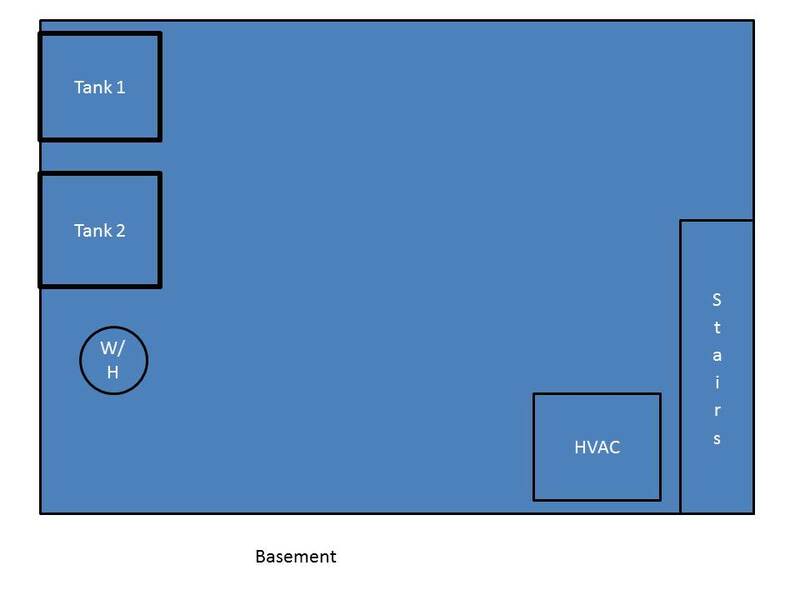 If you bring pictures of the area where you want to install your tank and a simple drawing , I will help you determine the best setup for positioning lines and filters. We can also make small modifications on the spot that would make your system very user friendly for your location. Simple drawing example. Can just hand draw layout as well. When you complete this class, you will walk away with the knowledge you need set-up and run your new aquaponics system successfully. Not to mention that you will have your tank system built and ready to set and function as soon as you get home! All class participants will receive the book and DVD from the foremost expert in Aquaponics in the United States: Sylvia Bernstein. Just choose the option that best fits your needs. If you just need the knowledge right now and a better understanding of the aquaponic system, then the Aquaponic Basics Class is for you. 9:00 am Aquaponics Basics-This will include everything listed above in the “Greenhouse Tour” plus the book and video to take home. If you understand the basics of aquaponic gardening and are ready to get your system set up[ and going, with the knowledge of building and maintaining the system, then the AP Tank Class is for you. 11:30am Tank Only Class-This class will be spent hands-on in building your own tank system to take home right after class*. It will include all instruction on the mechanics and maintenance of the IBC tank system. You will be able to leave the class with the knowledge to build more tanks or variations to fit your needs in your own space. This class will include Sylvia Bernstein’s book & video to take home. If you want to combine the knowledge of aquaponic gardening and starting your system, then come for the complete 1/2 day training! FULL CLASS-Best Value. Save $50 from the cost of both classes for a packed 1/2 day of training and education about aquaponics; leaving with all the information and material you need to get started with your own aquaponics system when you get home! * Includes everything in both of the above classes at a $50 savings, but as an added bonus full paid tuition will include ONE guest FREE. So bring an interested friend, neighbor, or relative and they can participate with you. Every class will have door prize drawings and giveaways throughout the class, so come prepared to make it a day of learning and fun! Classes held in Southeast Baltimore County in Dundalk. Times and exact address of class will be sent on your payment confirmation page. 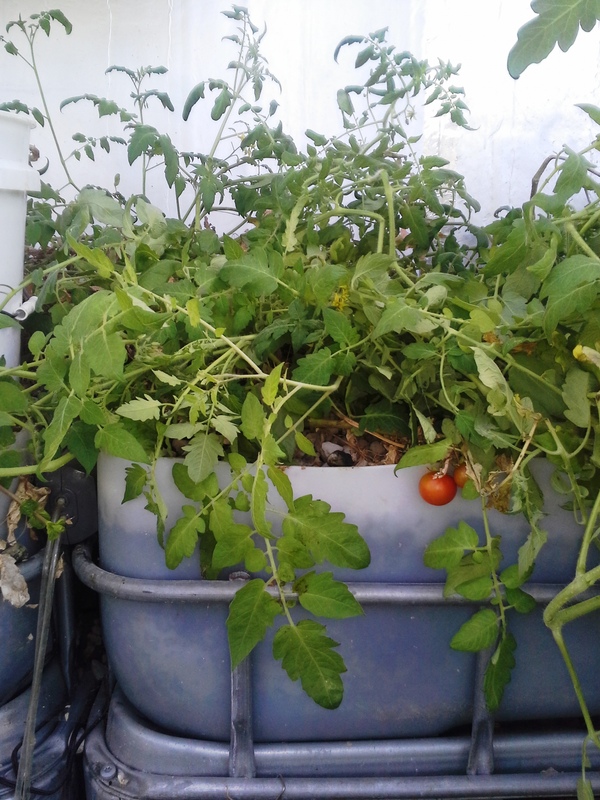 When I was in the greenhouse today cleaning out the filters on the aquaponics tanks, I realized that my 1 cherry tomato plant has taken over both of the grow beds. 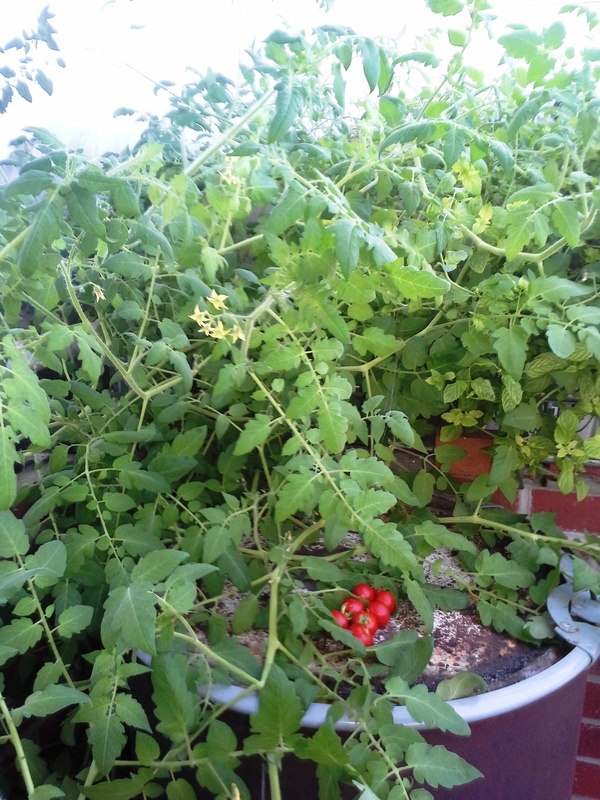 I planted 1(one) cherry tomato plant in January of 2015 and it is grown phenomenally. 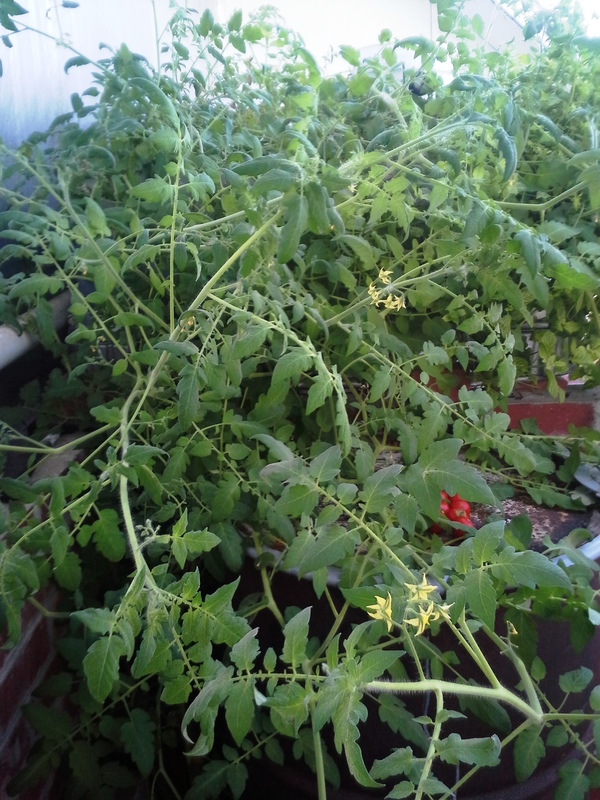 Not only has it grown, but it still flowers and produces great red cherry tomatoes. I am so happy that we decided to move forward with the greenhouse so I can extend my grow season and my aquaponics adventure! Let me emphasize this is one plant that has taken over more than a 4′ X 8′ section of the greenhouse-yet still producing after 8 months! I wonder if I can keep growing it as “permaculture”? Took a walk yesterday around our little suburban fifth acre. It was extremely hot and humid, so did not dawdle much, but I did get to survey our season so far. 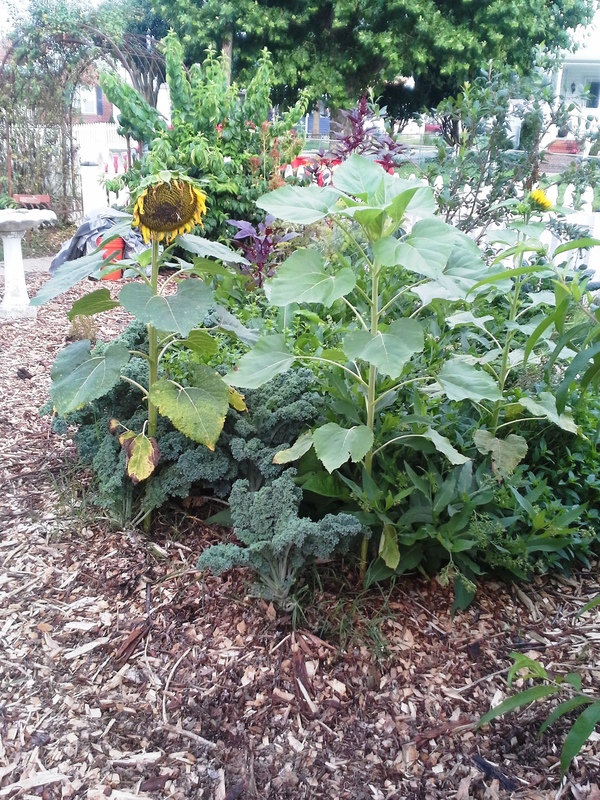 The front permaculture garden (more of a food forest) is doing well in the front yard. We utilize most of this greenery to feed the chickens daily and they seem to love the fresh greens everyday. 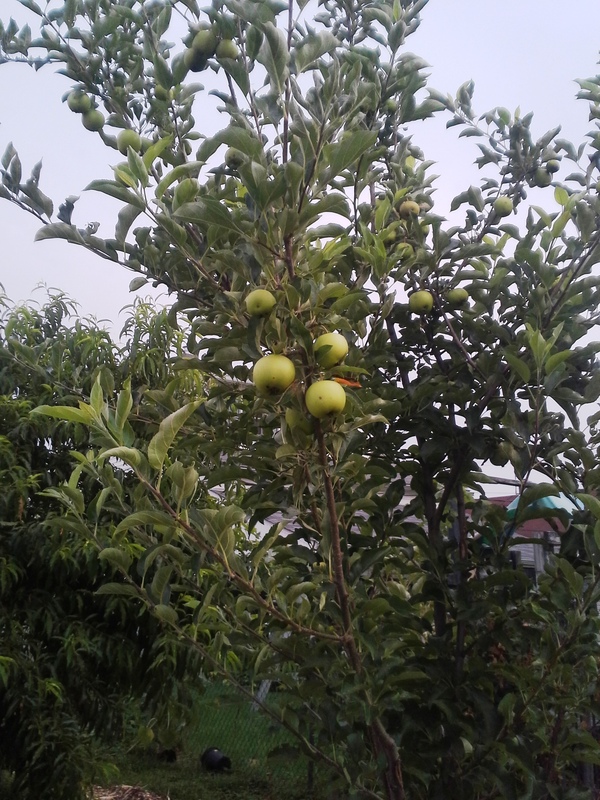 The fruit trees are 2-4 years old and they are beginning this year to bear some nice fruit. 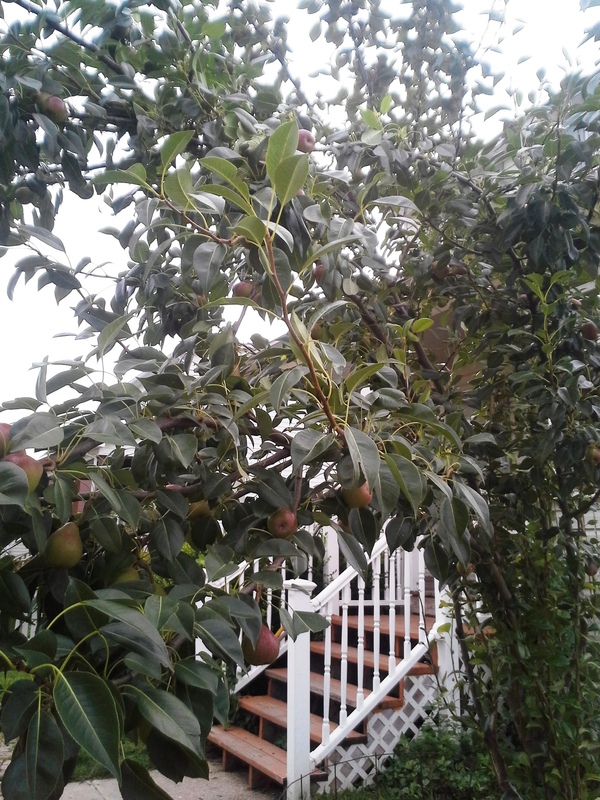 I look forward to the fresh pears, apples, and peaches. Oh, the grapes. 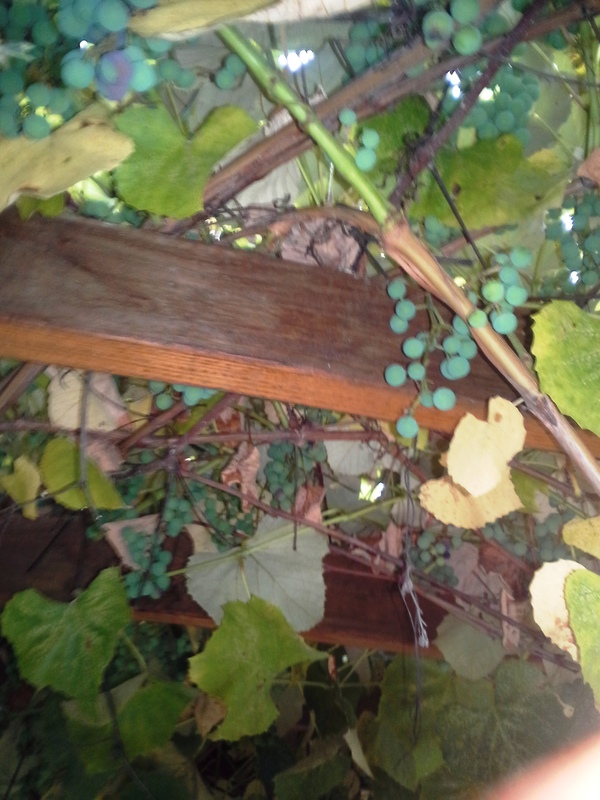 I am amazed at the amount of growth and fruiting that my grape vines are giving. 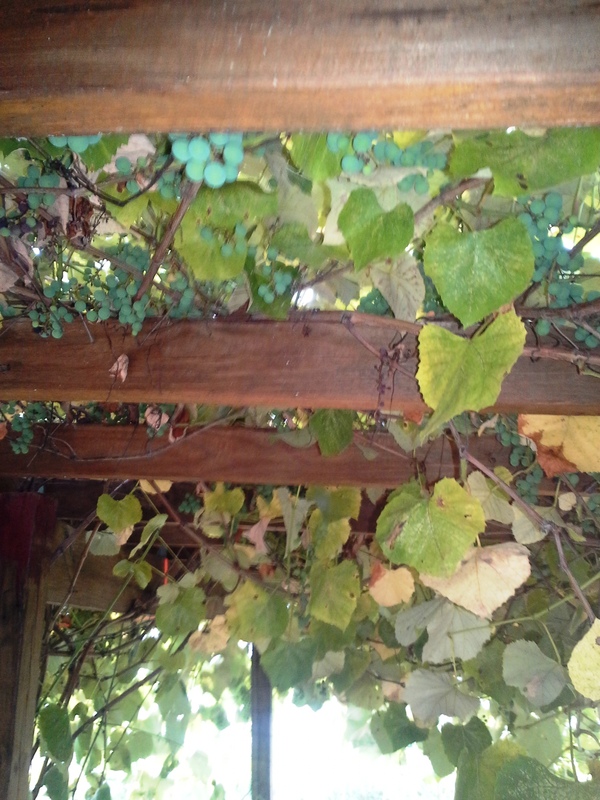 This is the third year on the grape arbor and I think they are taking to it well. A friend of mine built and gave me two grow barrels which I really like. In a two foot by 2 foot area I can grow up to 35 plants. 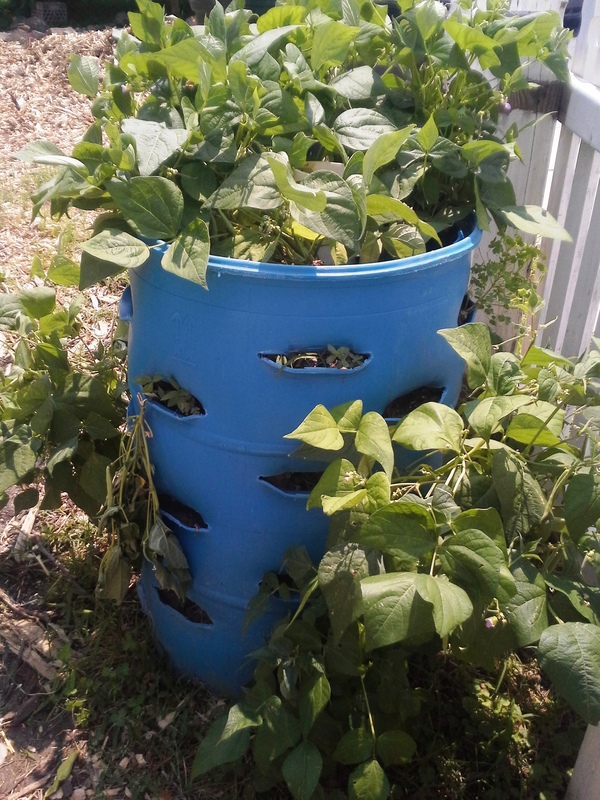 I have grown strawberries, green beans, tomatoes, and peppers very successfully in these. For the first time since I can remember, this year we ran out of canned green beans before this years crop came in. 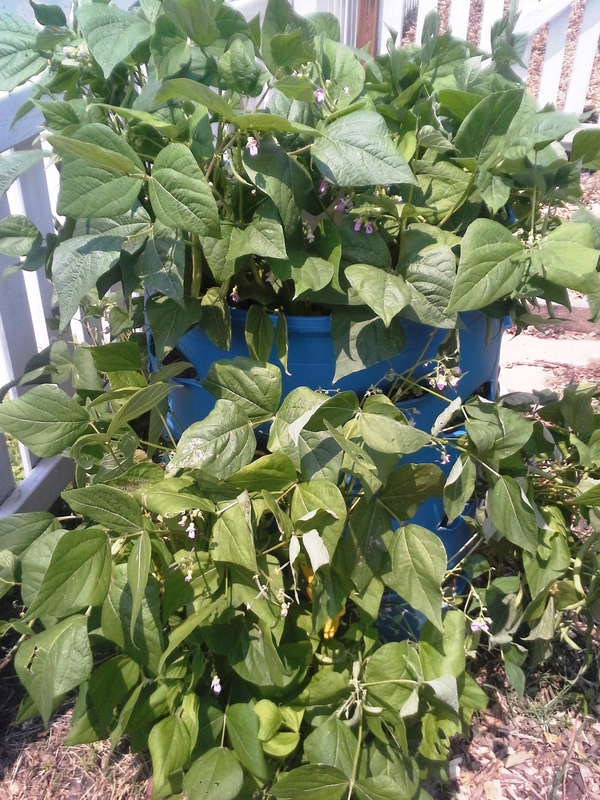 So I added several more areas for pole beans this year, along with the bush beans in the grow barrel. I hate running out of any vegetables that we regularly eat. This coming harvest should be an awesome time! Great informative article for any Backyard Chicken Flock owner. There are so many benefits to owning chickens that go far beyond the egg and the roasting pot! I wish we could get our local government board of Baltimore County to see the benefits far outweigh the usual diatribes of the ney sayers. Here is an article from my friend at Abundant Permaculture that outlines 8 strategies for putting the flock to work. “I am continually blown away by the working power of chickens on the homestead! They’re such great workers, I would keep them even if I couldn’t eat their eggs or meat. Plus, they reproduce themselves, unlike any man-made tool!